Light up your life with this antique hurricane lamp by B&H. Great glass shade. 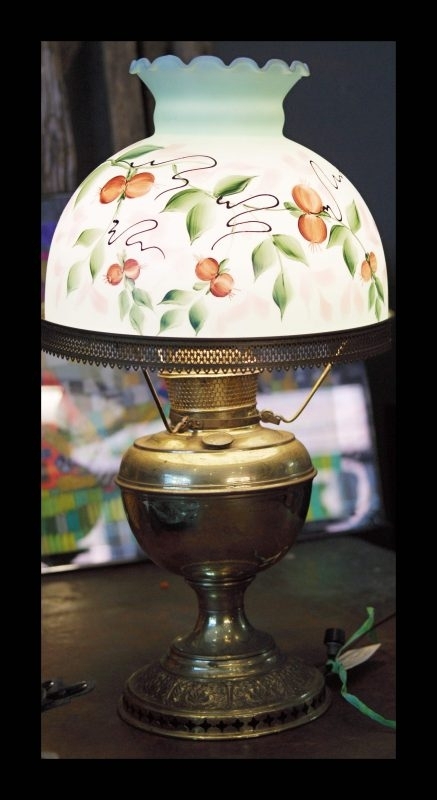 Brass lamp by B&H with wonderful hand-painted glass shade. Probably dates from the end of the Nineteenth Century. Wonderful old bird cage with original blue-green paint. A charming antique painted red cabinet that looks like it comes from a cottage in the Alps. This original antique WWI poster comes framed in a new frame which measures 16X22. Fabulous, colorful bags to carry everything from laptops to library books.